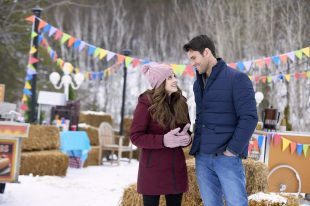 Hallmark Channel may have their next go-to romcom pairing with Jen Lilley and Kevin McGarry, who co-star together for the first time Saturday night in Winter Love Story. On the surface, it’s a bit of a narrative mash-up but the crackling onscreen chemistry of the leads makes it an extremely fun affair. Around here, we love Lilley, and Hallmark has kept her busy, most recently in Mingle All the Way. 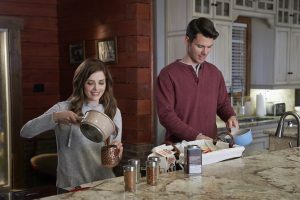 McGarry was on Hallmark Channel two weekends ago in Winter Castle, and he’s been added to the cast of the upcoming season of When Calls the Heart, so the Heartland veteran is about to be a very familiar face. In Winter Love Story, Lilley plays Cassie, a full-time barista at the coffee shop owned by her BFF, Becca (Joanna Douglas from last fall’s Good Witch) and a new author, whose debut book is a memoir about rediscovering herself after a bad break-up (on her birthday). McGarry is Elliot, a successful fantasy author riding the wave of his latest bestseller. They share a publisher, but have never met. That is until a joint book signing unearths a quick-witted banter between them. Soon, they’re paired for a short book tour to help her garner some buzz by capitalizing on the women who flock to his book signings and his books. 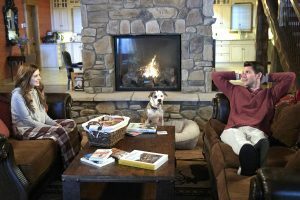 The road trip includes Elliot’s adorable dog, Bungee, and along the way, the two authors realize they have more in common than you’d expect. She’s delightfully surprised that his success hasn’t gone to his head, and he’s impressed that she’s determined to make a name for herself on her own merits, without drawing on the success of her mother, Jeannine (Mary-Margaret Humes), who’s been writing bestsellers since she was a child. There’s not a whole lot of friction between the two, until that final act, of course. Instead, it’s a story about kindness and bolstering each other and finding common ground as friends. Elliot genuinely looks out for Cassie and wants to help her succeed. When he confides in her that writing the third book in an extremely popular trilogy is a daunting prospect, she encourages him. I loved watching them together, until the inevitable hiccup that must be resolved, but it’s a teeny, tiny piece of the proceedings. I’m so glad Hallmark paired these two up. I’m going to go ahead and call it that we’ll see these two together again. T.W. Peacocke (Haven) directs a script by MacKenzie Austin (October Kiss). Laura Miyata, who co-starred in December’s Northern Lights of Christmas plays Cassie’s publicist, Piper. Rodrigo Fernandez-Stoll (Baroness von Sketch Show) is Elliot’s publicist, Julian. 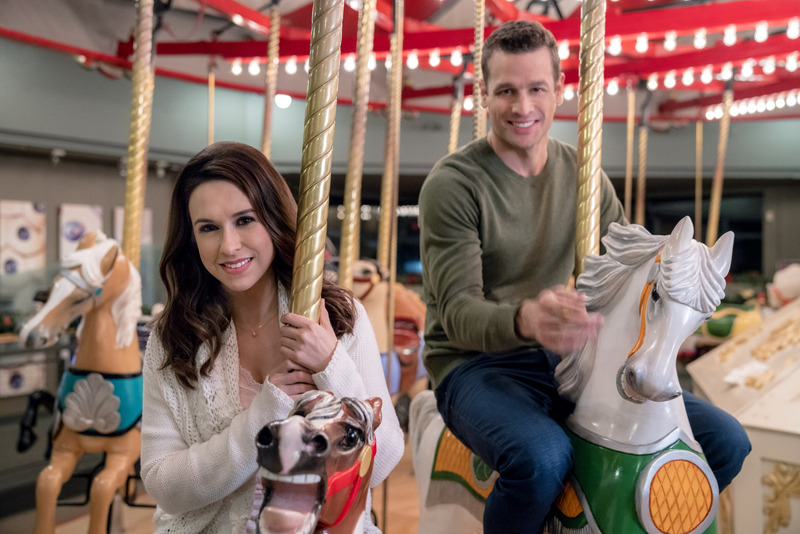 Winter Love Story premieres Saturday night at 8 pm/7c on Hallmark Channel. Here are a couple of sneak peeks. 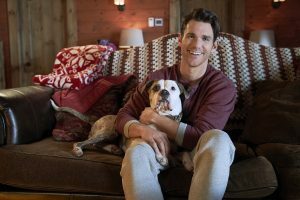 I loved this movie Winter Love Story and especially liked the dog Bungee so cute!! What kind of dog is he? 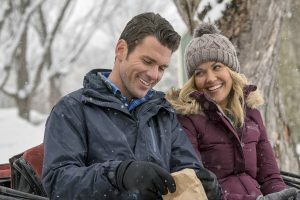 All of these winter Hallmark movies have been so good!! He looks like a boxer or boxer mix to me.